As part of our ongoing efforts to make StoreFeeder the number one bespoke eCommerce solution, we are pleased to announce the first set of our September service updates. This time we have focused on adding more options for customising your order processing and packaging. We will be announcing more functionality improvements in the run up to the Christmas period, so watch this space. The following are due for release on 06/09/17. Our newest feature has been designed with packing in mind. You are now able to specify a maximum weight for each of your packaging types. When your orders import, StoreFeeder will be able to factor the maximum weight capacity of each box into calculations for the number of packages required for each order, alongside the usual package dimensions. This way, you can be sure that no box will break as a result of product weight, and your packaging lists will be organised as efficiently as possible. For more information, see Knowledgebase: How to set up Packaging Sizes. We have made a change to allow you to change the VAT rate for each of your individual eBay listings. Usually, the VAT rate would be set by the product, but a field has been added on the Listing Details page, so you can easily reset the VAT rate depending on the eBay store the listing is in. We have modified Picking Notes to accommodate longer pickbin names. Additional lines will now be created if the name exceeds a single line character limit. We now support multiple labels for orders despatched with APC Netdespatch. When you manually adjust the number and type of packages on your orders, StoreFeeder will print the correct number of labels accordingly. If you have any suggestions for improvements or further ways in which we can benefit your business, we would love to hear from you. From all of us here at StoreFeeder, happy selling. Our second set of updates this August will soon be released, and this time we have focused on improvements to existing features, along with the introduction of our newest webstore integration. Each of our customer’s businesses are different, and we pride ourselves on the level of customisation and bespoke options we offer. Our updates are always developed to benefit our customers, often down to an individual level. Here is a brief rundown of all of the updates due for release on August 23 – 2017. Our webstore integration for Magento V2 is now live. When you delete a Shipping method you no longer use, or have replaced, StoreFeeder will archive it now instead of deleting it. Previously, any order still assigned to a deleted shipping method would display ‘Default Shipping Method’, but now the archived shipping method will be displayed. Furthermore, you will be able to select archived shipping methods when filtering your orders. Depending on the size of your workforce, and the different roles within your company, sometimes it is necessary to refine StoreFeeder’s user Permissions. By request, we have added an additional level of user permissions so certain tasks can only be performed by admin users. You can activate this feature by contacting our support team. If a non-admin attempts to perform these tasks, a popup message will appear explaining the current user setting does not have sufficient permissions, and the user will need to speak to an admin. 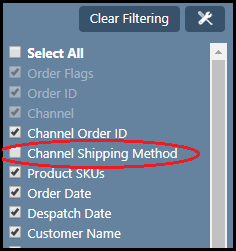 By request, we have added a channel shipping method column to the Orders Overview page. This will allow you to group together and filter by each shipping method chosen by your customers in-store, for ease of service selection. This column is hidden by default, but can be switched on by using the filter icon, and checking the option. We are including more ways to communicate with your customer base through StoreFeeder, and the new ‘Assigned’ status in your Company Identity Email Setting will send an email to your customers as soon as their orders have been placed in a pickwave, so they know their order is being picked and packed, ready to be shipped. To active this, go to your Settings > Email Configuration > then in the Company Identity section click > Edit/View Email Settings, and use the email notification toggle switches. For more information see Knowledgebase: Email Settings. StoreFeeder has always been designed with our customers’ options in mind. As such, we have changed the setting that allows your listings to be uploaded to channel by default. This way, you can create new integrations at your own pace, secure that nothing will be uploaded to your channels without your confirmation. You will need to turn the ‘Upload listings’ toggle back to ‘On’ when you are ready to activate your new integrations. It can be found in the ‘Stock Management’ section of each ‘Integration details’ page. We are changing the ‘upload products’ default setting when you create a new channel integration. The setting will now to switched to off by default. Remember to make use of our UserVoice service to make any suggestions for improvements, or to vote on other suggestions that apply to you and your business. Our support team are always happy to answer your queries. from all of us here at StoreFeeder, enjoy the rest of the summer, and happy retailing! As part of our August updates, we are proud to announce a new integration, and several new additions and improvements to our service. Further details can be found in our accompanying knowledgebases. We are pleased to announce our newest courier integration: DX. To enable best offers, go to the ‘Payments and handling’ tab of an eBay listing, and you will be able to toggle Best Offers, choosing the minimum best offer price to set on your listings. Only accepted offers will be downloaded into StoreFeeder. You can also set a Best Offer Auto Accept Price, so when a customer makes a best offer of that price or higher, the order will be automatically accepted. Don’t forget to check the values you have for your existing eBay listings. We have added the option to set a lead time for each of your suppliers in order to calculate due dates for purchase orders. You can find this option on the ‘Edit/View supplier’ page, enter a number of days, and this will automatically adjust the due date on any PO raised for this supplier by that number of days. If no value is set, it will default to one day. StoreFeeder now supports Amazon Prime orders across many of our features and pages. When an Amazon Prime order is imported into StoreFeeder, it will now be flagged as such. You can filter for your Amazon prime orders in the Orders Overview and Picking pages. Additionally, you can now include Amazon Prime orders as a criterion for Shipping Rules. We have added an option for your eBay listings, which will prevent any updates except for inventory levels being made to eBay listings that are currently part of an active sale. The Save and Upload button on the Listing Details pages will be hidden while this setting is switched on, and the listing is part of an active sale. We have added 2 new fields that can be mapped when uploading your orders, Billing Company and Shipping Company. When you import an order with these fields mapped, the billing and shipping address company names will be visible in shipping and billing address details. When you create a new order with an offline payment, we have added a handy change calculator. 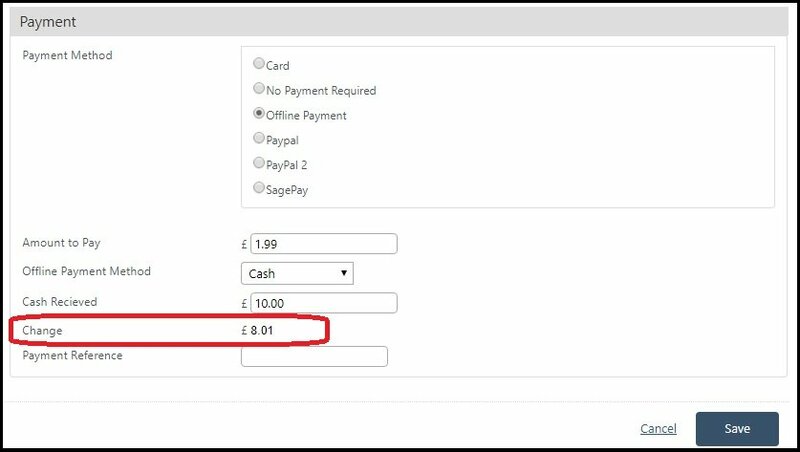 When an amount is typed into the Cash received field, the change to give to the customer will be automatically calculated. For our customers who utilise different transaction rates offered on different PayPal accounts, we have added the option to override the email address associated with particular eBay listings in StoreFeeder. By using any of these options, you can control the PayPal account you wish to use for each of your listings. Where previously you could only create Mirakl listings for existing product EANs, we have built in the functionality to create listings for wholly new products. A new ‘Edit’ option has been added to Mirakl listings where you can input images, attributes, and product descriptions, before saving your listing and uploading it to channel ready for internal approval. If you have any further suggestions for improvements, or suggestions as to how we can sever your business even better, let us know by visiting our User Voice service. From all of us here at StoreFeeder, we wish you an enjoyable and productive remaining few weeks of Summer. Look out for our next set of updates at the end of this month. Happy selling! We would like to invite you all to share in an exciting opportunity with us. In the last few years, our business and yours have grown exponentially together, and to further develop the relationship we have with our clients, we are planning to hold one or two workshop events in the coming months. If you are interested, please take a few moments to answer some questions, and email your response to events@storefeeder.com. How many people from your company would you like to attend? How far would you be willing to travel? StoreFeeder is based in the Midlands, so is a location in the Midlands convenient for you, or would two smaller events in both the north and south be more ideal? Is there any particular training you would like to receive, or any further assistance we can offer? Are there any special requirements we should be aware of? Please include any additional information or suggestions. We ask that you respond as quickly as possible, as the earlier you register your interest, the higher your chance of securing a place at the event. We will be sending out invites as soon as we can. Our latest release is about to go live, and we are proud to announce another major feature to make the managing of your business run even more smoothly and efficiently, along with several service and functionality improvements. Here are the updates in brief, due for release soon. This feature has been designed to save you a huge amount of time when raising your purchase orders. We have added a new ‘Requisitions’ tab to the ‘Purchase Orders’ page. Where previously, you would have to access the page for each of your suppliers to raise a Purchase Order, the Requisitions feature will allow you to do it all from a single page, all calculated from your current levels of stock. The page can be split by supplier or warehouse, and will suggest which products you need, recommends the required quantities for each of those products. If you receive an order which would put one or more of your products out of stock, a requisition would be raised to order more of that product. Each purchase order raised by this feature is a fully adjustable draft, and will require your verification before it will be sent off to your suppliers. At StoreFeeder, we will never automatically send a purchase order without your permission. You can now create multiple warehouse zones through the rest API. For more information, see our API documentation. By request, and to better display your sales analytics, the dashboard graphs now have a drop-down box allowing you to view your sales by revenue or units sold. Along with Domestic, we now support ‘International’ and ‘UK Mail Packet Service’ consignment types. Our mission statement here at StoreFeeder is to let our clients sell more, and work less. If you have any suggestions as to how we can continue to do this for you, please leave your comments on our UserVoice page. If you are not a StoreFeeder customer and are considering joining us, or you are just interested in the service we provide, please get in touch at hello@storefeeder.com or visit our website. Rather than a Friday round up of sites this week, I’ve collated a few handy search engine optimisation (SEO) tips for you to use on your ecommerce website. Whether you have a multi-channel ecommerce operation or not, SEO is an important factor to help you rank well in search engines such as Google. It seems Pinterest are building up some steam! This week I’ve seen a number of posts relating to Pinterest and they’ve caught my attention. As a Pinterest user myself, it’s been interesting to read about the social bookmarking site from a marketing angle. Since we first showcased StoreFeeder back in March at the Internet Retailing Expo we’ve made a lot of exciting improvements and updates to the software which we’ve really been looking forward to showing off! Along with our new look logo and website of course. We’re currently on Day 2 of the eCommerce Expo and receiving fantastic feedback about StoreFeeder from those we’ve already spoken to. StoreFeeder is multi-channel software written by a company (that’s us) who know the ecommerce market inside and out, and with the help of our existing users we’re continually adding new functionality.